Plant biomass growth, storage, and decomposition connect nitrogen (N) and phosphorus (P) cycles, yet we know relatively little about the dynamics of such coupling under nutrient enriched conditions, and our understanding of the interactive relationships between plant N and P in drylands remains particularly poor. 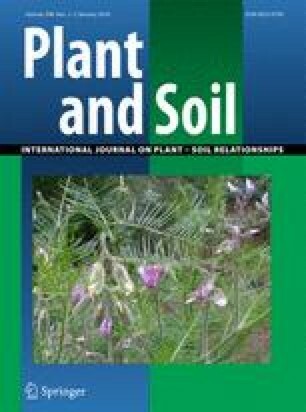 In a semiarid steppe of northern China, we examined the effects of single and combined N and P additions on soil and plant N and P pools for both mature and senesced leaves in two dominant grasses: Leymus chinensis and Stipa grandis. Nitrogen additions increased N concentrations in mature and senesced leaves for each plant species, and decreased N and P resorption during leaf senescence. The effects of N additions on foliar P concentrations were species-specific, while P additions had no effect on any nutrient characteristics examined. Due to treatment effects on N resorption, N and P concentrations were tightly correlated in senesced leaves but not in mature leaves. Taken together, the results suggest plants in this ecosystem are much more responsive to changing N cycles than P cycles and emphasize the significance of nutrient resorption as an important plant control over the stoichiometric coupling of N and P under nutrient enriched conditions. The online version of this article (doi: 10.1007/s11104-015-2642-y) contains supplementary material, which is available to authorized users. The authors thank Weijun Wu and Shuxia Liu for help with field measurements, Qiang Li and Li Li for help with laboratory analyses, and two anonymous reviewers for suggestions that significantly improved the manuscript. This study was financially supported by the National Basic Research Program of China (2015CB150802), the National Natural Science Foundation of China (41273094 and 31470505), the Strategic Priority Research Program of the Chinese Academy of Sciences (XDB15010403), the State Key Laboratory of Forest and Soil Ecology (LFSE2013-13 and 2015-16), the Youth Innovation Promotion Association of the Chinese Academy of Sciences (2014174), and the Key Laboratory of Vegetation Ecology of the Ministry of Education. Any use of trade, firm, or product names is for descriptive purposes only and does not imply endorsement by the U.S. Government.